Here are the Featured Bloggers for January 28, 2016! Christmas is coming faster every year and this year I am wanting to decorate simply and naturally. I found this great pine cone craft on make-it-love-it. Before I could make the craft I collected pine cones from my yard and cleaned them. I found out how to clean the pine cones on twoityourself. Getting rid of the bugs is vital, because it is gross not to. As I was preparing the pine cones for cleaning several bugs came climbing out. I am so glad I killed all the bugs by cleaning the pine cones. Basically all you need to do to clean a pine cone is line a cookie sheet with tinfoil, lay the pine cones out in single rows and bake them at 200 degrees for 20-30 minutes. I was quite nervous about this at first, I didn’t want the pine cones to burn, starting a fire or smell bad. Neither one of those things happened. It was quick and easy and effective. After I cleaned the pine cones I sprayed them with a light green glitter spray paint, to shine them. make-it-love-it sprayed hers with a clear gloss, I’m sure that would be beautiful and easy too. I always try to use what I have before I purchase anything new. I had the green glitter spray, so I used that instead of buying a glossy shine. Then I glue gunned the rope to the top of the pine cone large enough to wrap around the Christmas Tree branch. 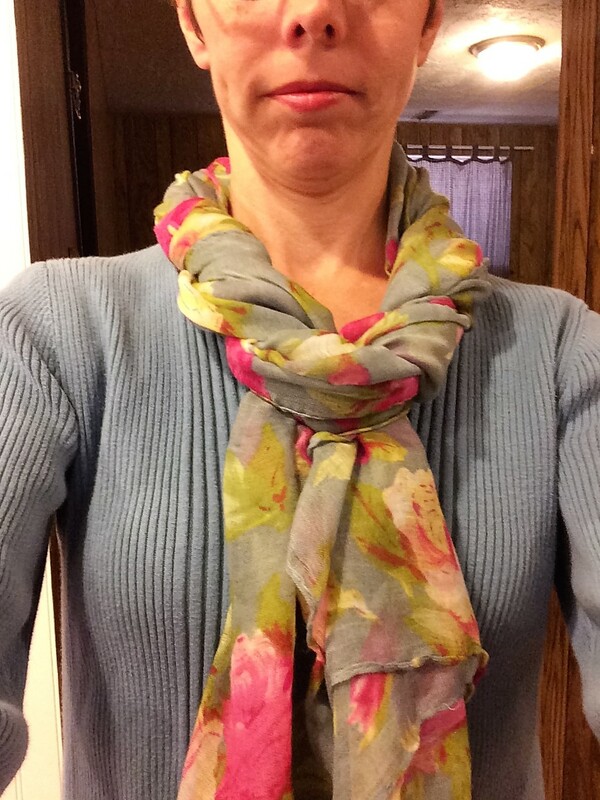 Then I tied a small ribbon and glued it on as well. I love how they turned out. Each ornament is unique and different from the other. And the whole process from gathering pine cones to baking to finishing only took about 40 minutes. I think the tree this year will have a wonderful new look to it. I cannot wait to show you the finished tree in a few weeks. I have something fabulous planned. Thank you make-it-love-it and twoityourself for the great tutorials. So, while searching Pinterest for inspiration for my kids Toyroom. I saw several different versions of this idea and thought they all looked adorable. I especially liked the one from designimprovised.com. It also looked super simple. So, I decided to give it a try. It was super quick and super easy! I love how it turned out. All you have to do is simply pin some rope to the wall where you want the artwork to be displayed and then pin the artwork on with clothes pins. Voila! You have an adorable display for your kids artwork! I especially love that it can hold all different sizes and shapes of artwork and crafts, like owl and heart shaped crafts my kiddos made in school! I am considering painting the clothespins like Haeley from designimprovised.com did and adding embellishments at the end. Maybe something like this one only homemade. If I end up doing it I will post an update and show you all how it turned out! 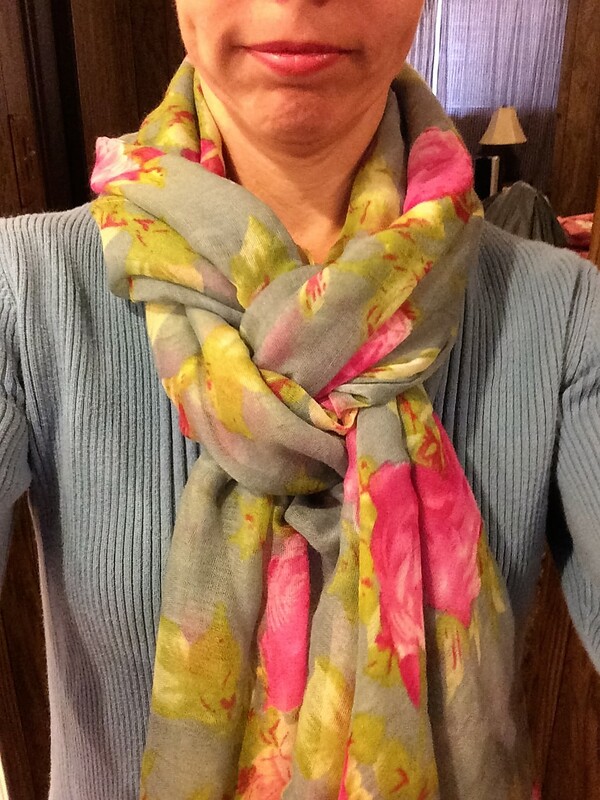 I love making new things. 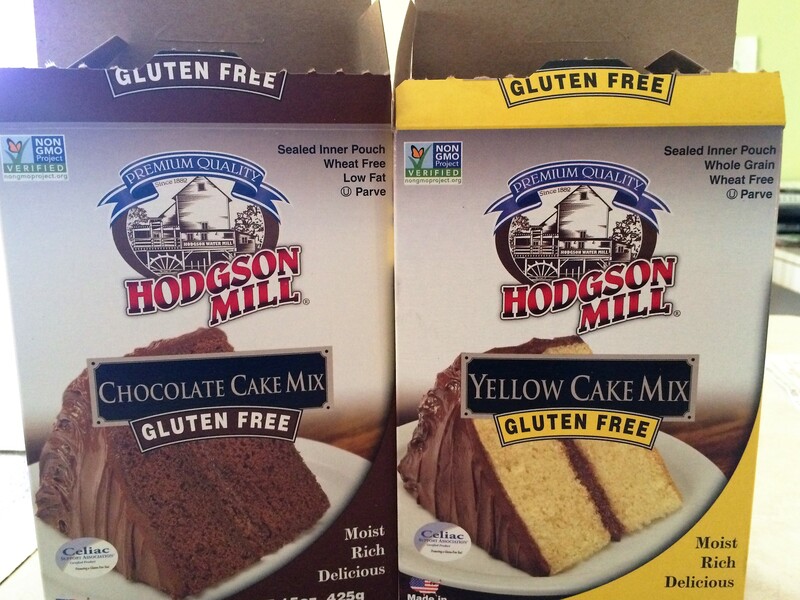 The same ‘ol – same ‘ol get boring, especially in the Gluten Free world. We often feel so limited on our options and food can end up not very exciting – and who wants to eat food over and over again that is not exciting. 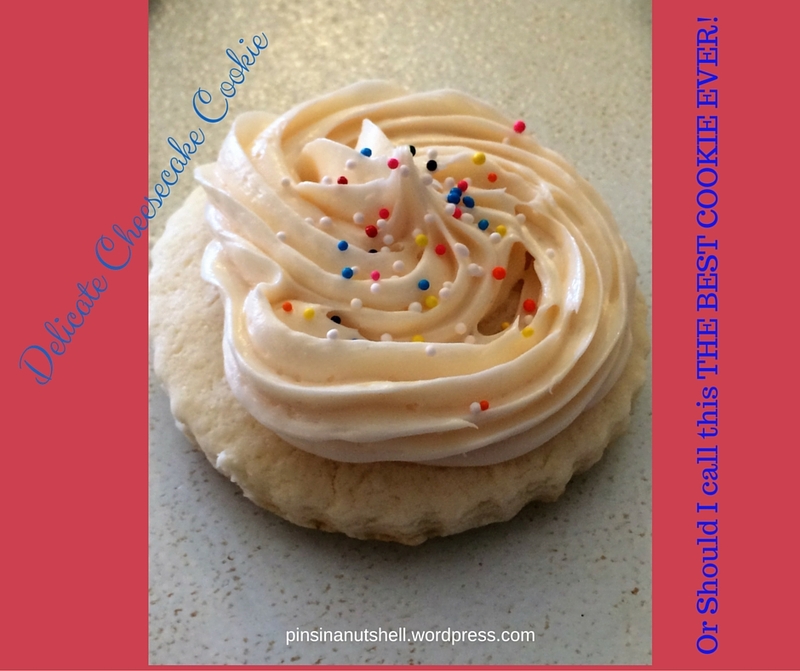 And then there are these cookies! They have changed our world! And I’m not exaggerating. These have to be the best cookies ever! 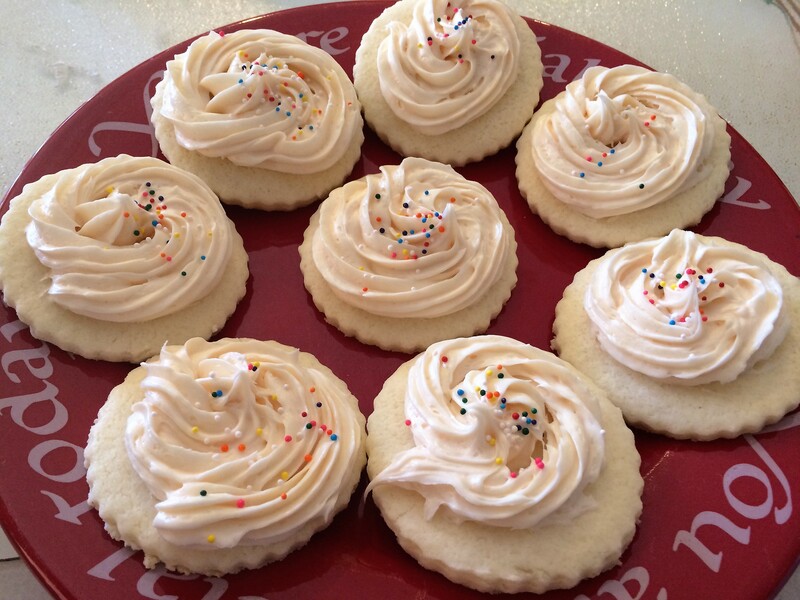 After scouring Pinterest for something new I found this recipe on Gluten Free on a Shoe String, Nicole calls them Soft Gluten Free Cream Cheese Sugar Cutout cookies. (I do love this site, and most recipe’s have worked out for me). I prefer to call these cookies Cheesecake Cookies, because that is exactly what they taste like. I used my favorite and trusty Grandpa’s Kitchen Flour. Basically the big difference in these cookies between regular sugar cookies and cheesecake cookies is that instead of butter you use cream cheese. The difference is like comparing a home firework show and a professionally done firework show. Really there is only one good option. I don’t know if I can ever go back to regular ‘ol boring sugar cookies again. 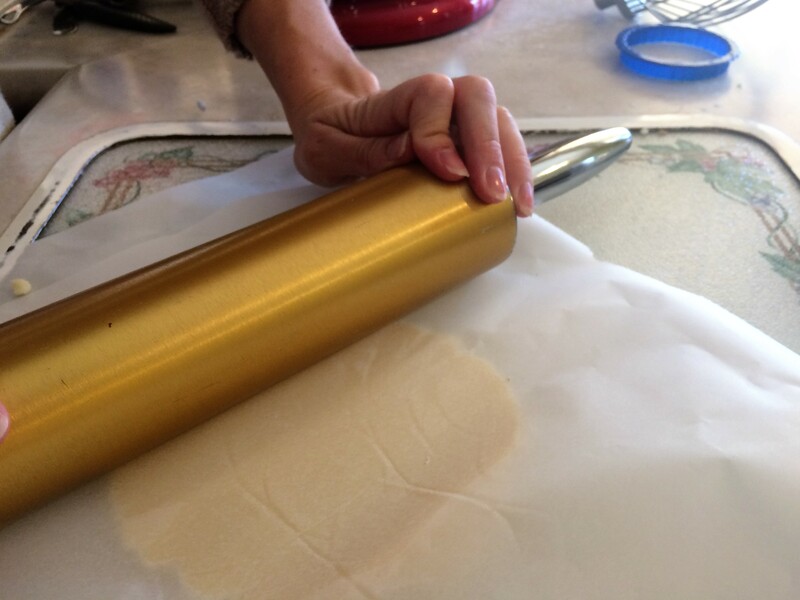 I like Nicole’s tip of using parchment paper in the rolling of the dough process, that sure made things easy, and less of a flour taste too them. I cut out the cookies in circle shapes, I’m sure any shape will do. And a two more important tips she gave that I wouldn’t ignore. 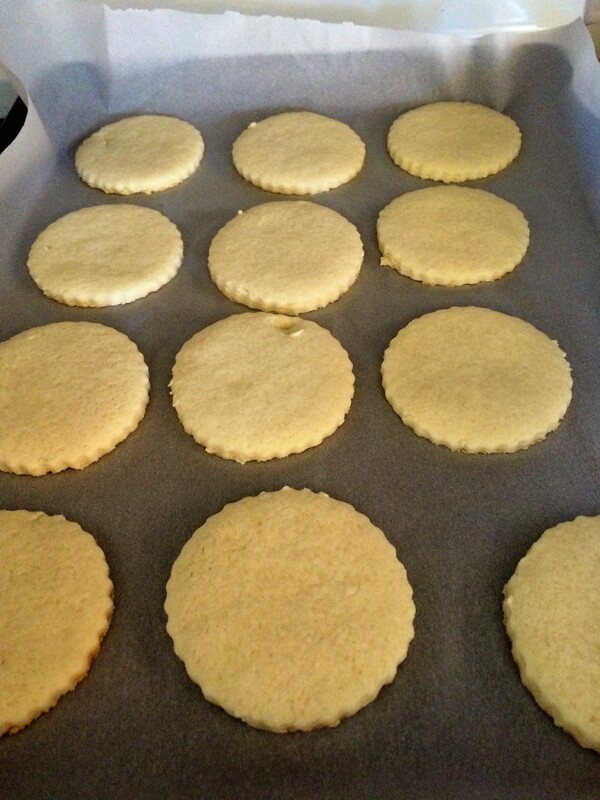 2- After transfering them to the cooling rack I let them cool about 10 minutes more before frosting. If the cookies are warm (even a little bit) the frosting will melt a bit and you don’t want that. I gave the cookies to several people, Gluten Free and Non-Gluten Free and all were sure impressed with over all taste and appearance. When I made the frosting it seemed a bit flaky and dry to me, so I added a bit more liquid (vanilla and a bit of milk). The consistency was perfect. 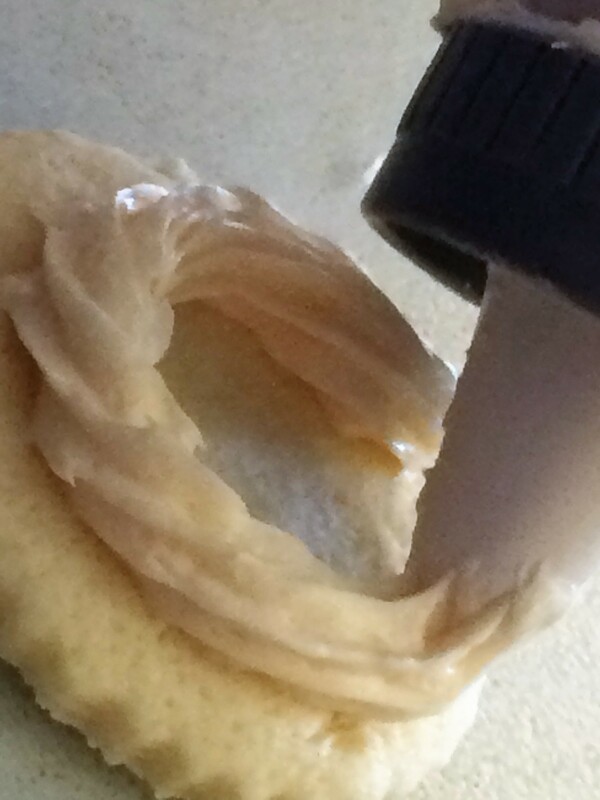 You want the frosting to be thick so it stand up on the cookie, instead of melts and flattens. It looks so nice and pretty that way. I’m sure you could just as easily spread the frosting on the cookie, but I tried hard for the kids I gave these to so I pipped the frosting. But piping the frosting makes you use a lot more frosting then if you just spread it on the cookie. One more quick tip about the frosting, I didn’t have enough powdered sugar to make a whole batch of frosting, so I had to 1/2 it. This made me need to use store bought frosting (which I already had) for a portion of the cookies. 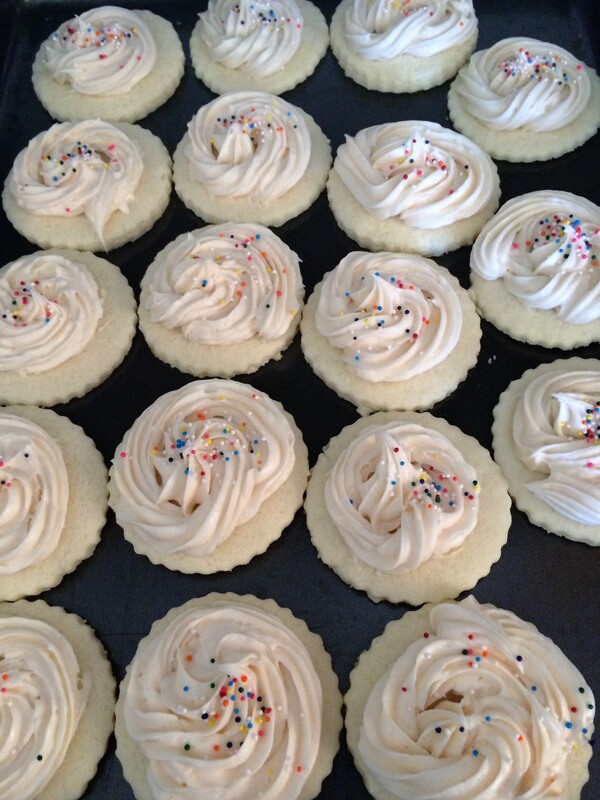 I used Pillsbury Gluten Free Cream Cheese Frosting, for some of the cookies. Those also turned out perfect too. Either frosting is a good option. Thanks Gluten Free on a Shoe String! These are the best! 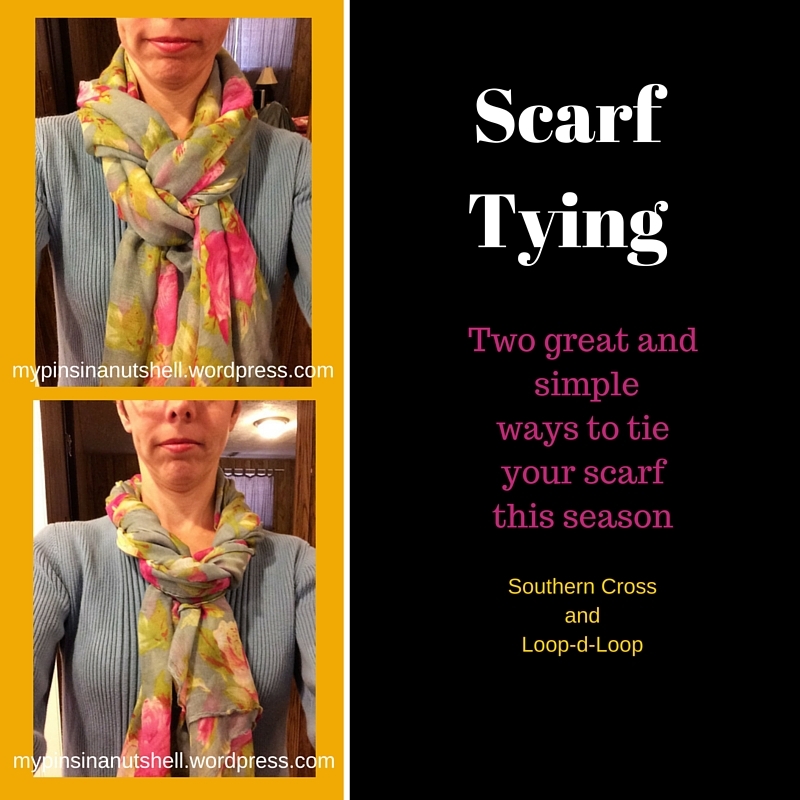 I found this tip on themamasgirls.com. It really does work perfectly every time. I am not much of one that plans ahead, or if I am on top if it and I know i’m going to be baking, I always forget to leave the butter out for a few hours. So when it comes to baking I end up with hard butter to use. So this quick tip has saved me so much agony and time. And it has helped my kids enjoy many more treats. Just remember 5 seconds on each side in the microwave. 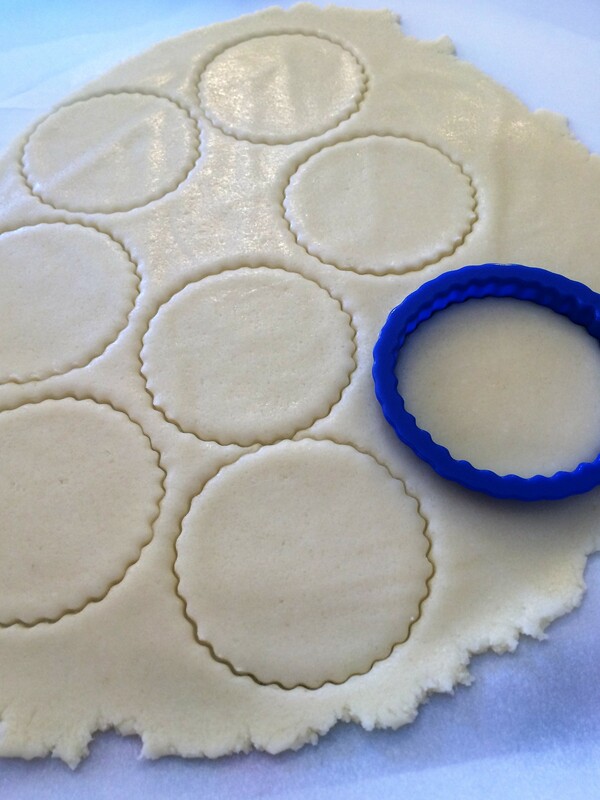 A perfectly usable soft butter every time. 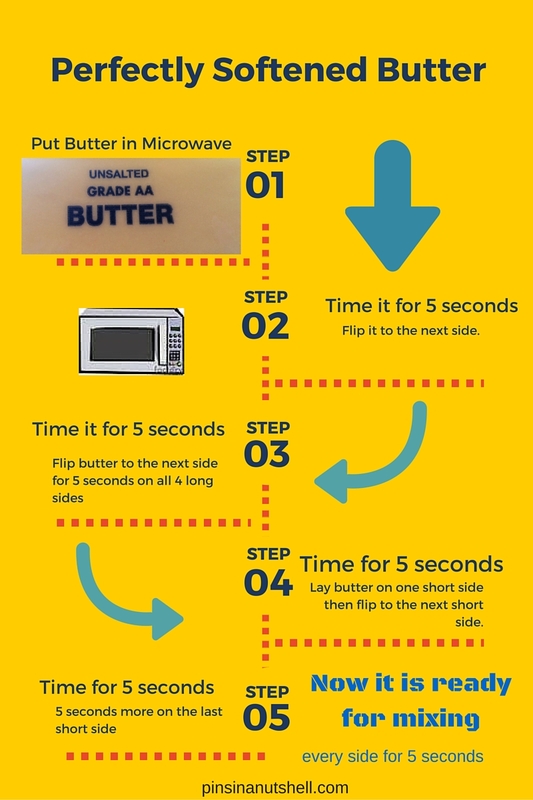 We have done this several times over the past few months and the butter is perfectly soft and ready to use. No more planning ahead. I can just bake when I want to and when I have time. I love trying out new hairstyles. 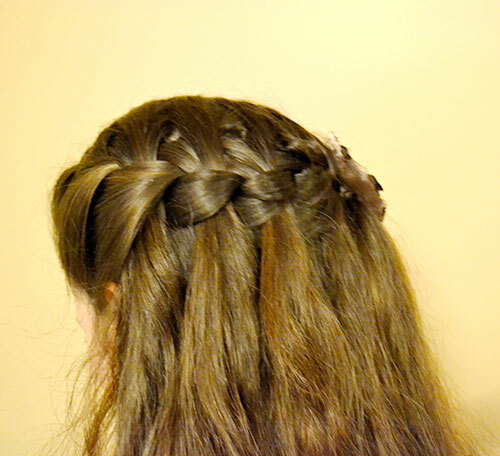 I tried a waterfall braid found on makeit-loveit.com, it looked adorable. She referred to a video tutorial on sweetestbugbows.com which really helped me figure out the technique and it looked simple. So, I decided to give it a try… I tried it on my self first and that worked out well. It stayed in throughout the day and looked nice. 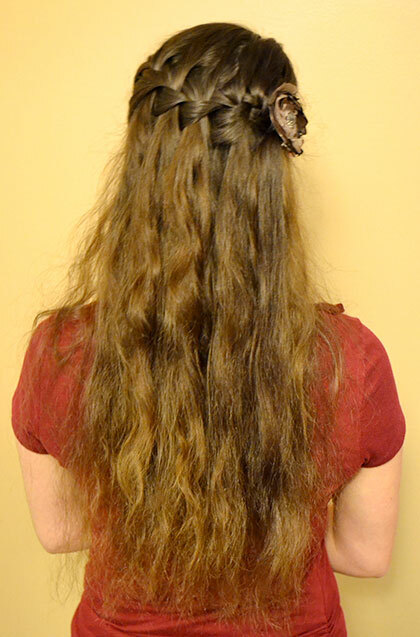 It was quick and easy and looked pretty good even on my hair that came straight out of a messy bun. It would probably look even better if I straightened or curled my hair. 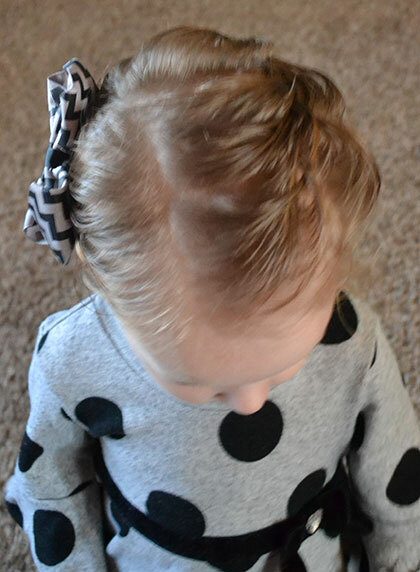 So I decided to try it out on my two little girls since it was touted as a little girls hairstyle. Well that did not go quite as well. 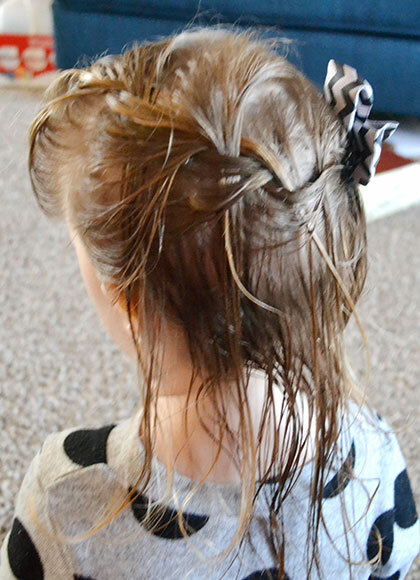 It turned out OK on my four year old who has long thick hair but it did not last very long. This hair style loosens very easily. 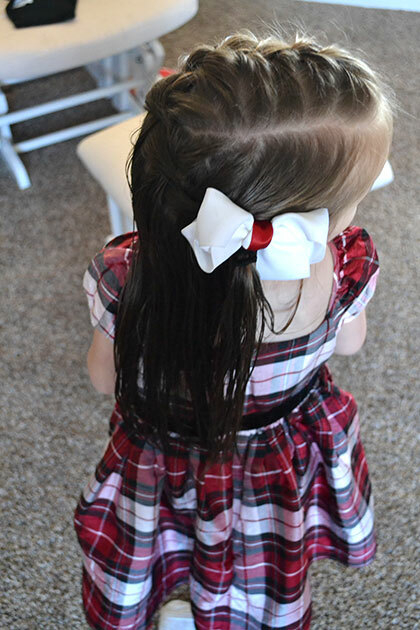 By the time we got to church my four year old’s hair was a mess. It seems to last longer on longer thicker hair. 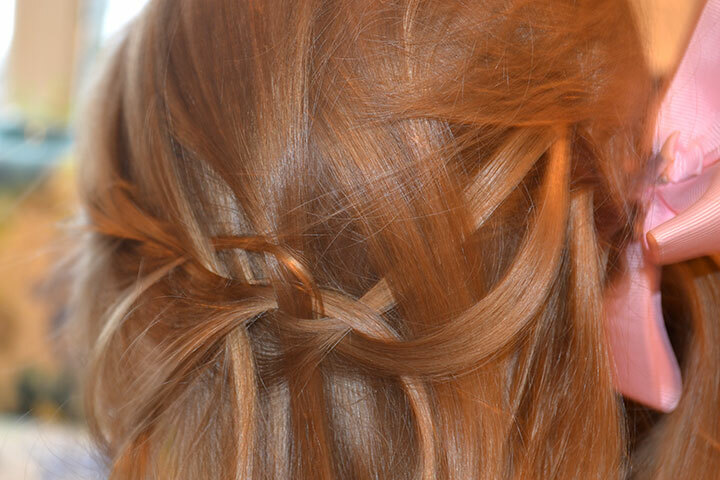 The thinner and shorter your hair is the less likely you will have success in keeping this hair style in. So when I tried it on my 2 year old; the beginning was falling out by the time I got to the end. 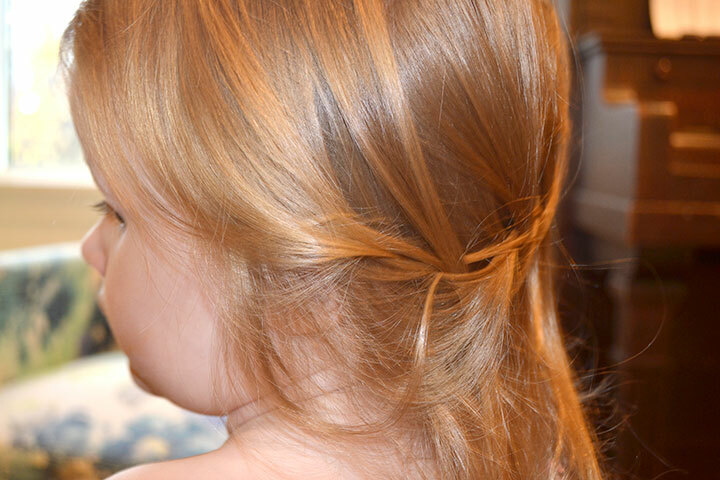 It probably didn’t help that I was trying to braid a very active toddlers hair. 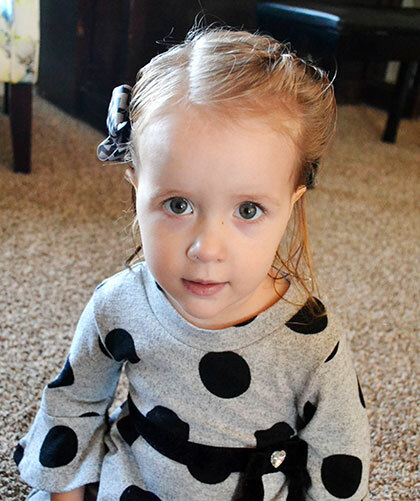 Perhaps I could have gotten it tighter if she wasn’t wiggling so much. I tried it several ways (with wet hair, with a little bit of Aloe Vera gel for texture, using smaller pieces of hair, and on dry hair). None with any luck. 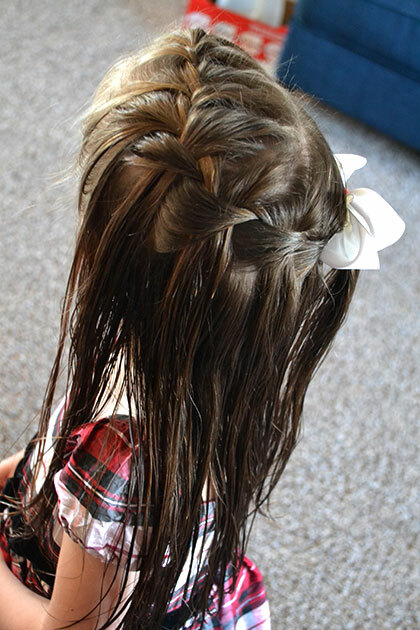 This style just wouldn’t stay put in my toddlers hair. The front looked cute but it still just fell out five seconds later. 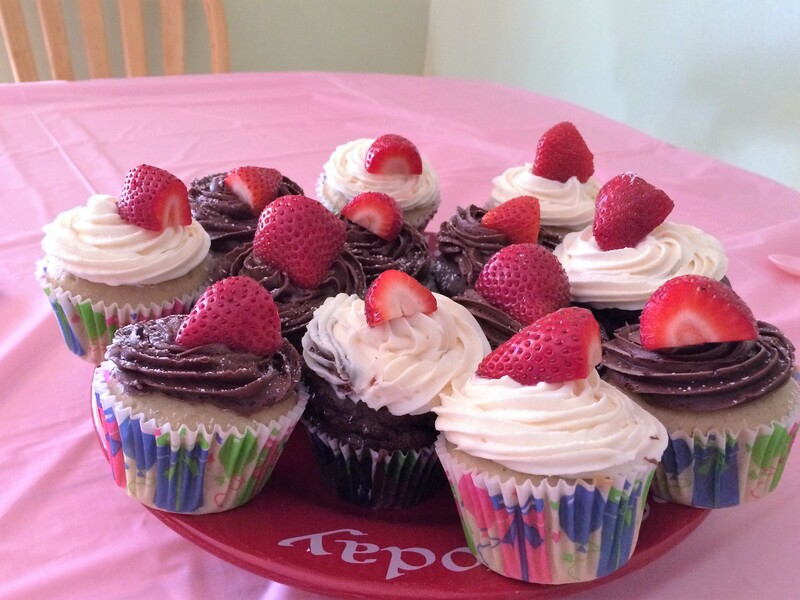 So my youngest was having her birthday party and I usually make Gluten Free cupcakes anyway, so that part isn’t hard. I just bought a mix. However one of her friends is trying to figure out their stomach issues and they have found he has to stay away from milk, and gluten and many other things. 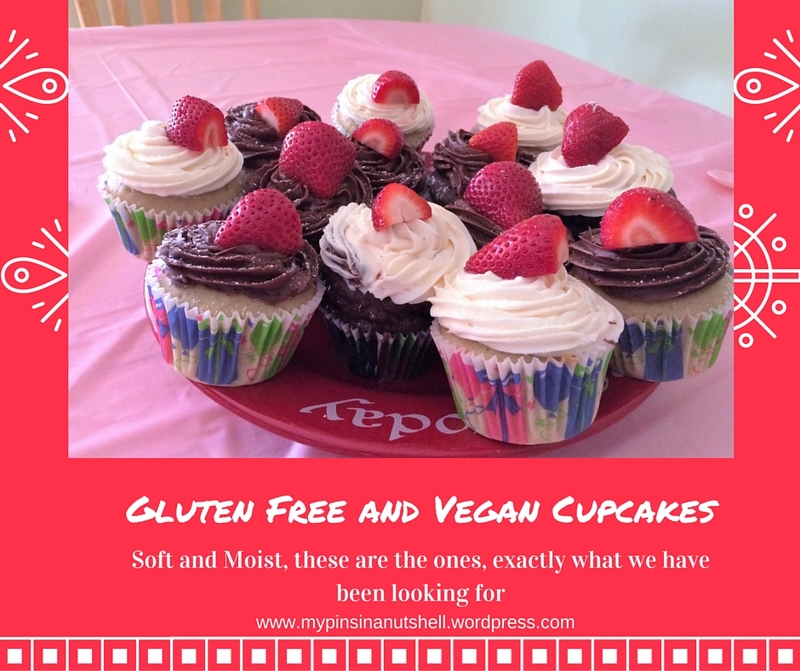 We always eat gluten free due to allergies and I used to have to substitute out the milk in recipe’s, so I figured I can do the same with these cupcakes. The end result, perfect moist cupcakes, better then the original. I used Pillsbury frosting which uses soy, not milk. You can use whatever suits you best. Topping with a strawberry, to make sure this little boy who is allergic to many foods was ok, is a good and healthy alternative to sprinkles. None of the kids could tell the difference in the cupcakes, they just ate them happily, and the little boy did not get sick Win-Win. The world of food opened up so much when I learned to substitute. Coconut milk has always worked for us in soups and desserts. Yes there is a bit of a difference in flavor, but the flavor is still very good. Somehow cooking the coconut milk takes away its sour flavor. But remember the coconut milk is thick, so adding some of the coconut water or a little extra milk always seems to help. We love smoothies in our house! I am constantly trying new smoothies, some successful and some not. My kids like trying them all though, so that is nice. This particular recipe I found floating around Pinterest, but the link didn’t work, so I cannot give proper credit. I did change up the recipe from the original to accommodate what I already owned, and to serve all 6 of us, so I guess it is kind of mine anyway. This recipe was a big hit, so I thank the original writer or starting me off right. 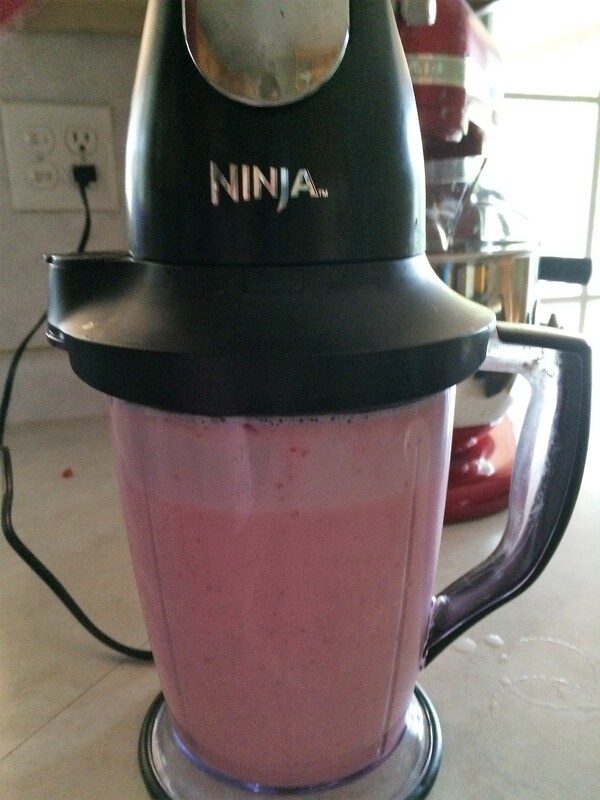 The original called or frozen strawberries, no raspberries and vanilla yogurt. 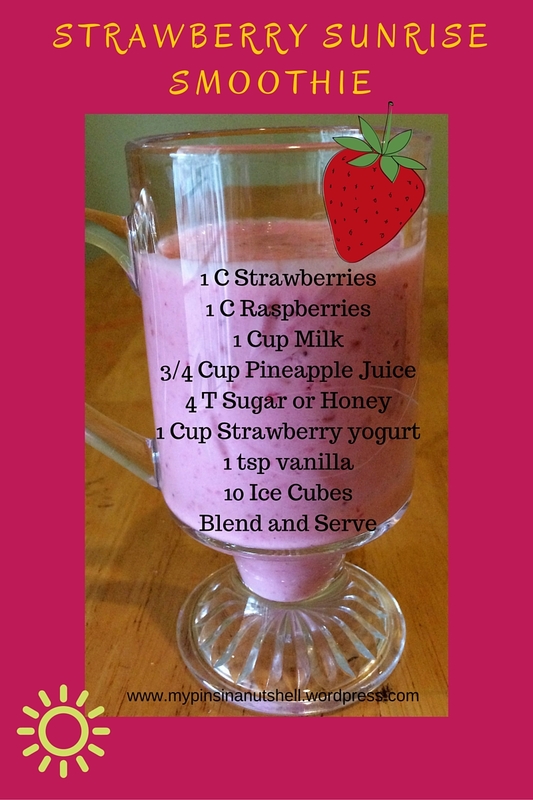 This smoothie was so very very good and we will make it again. 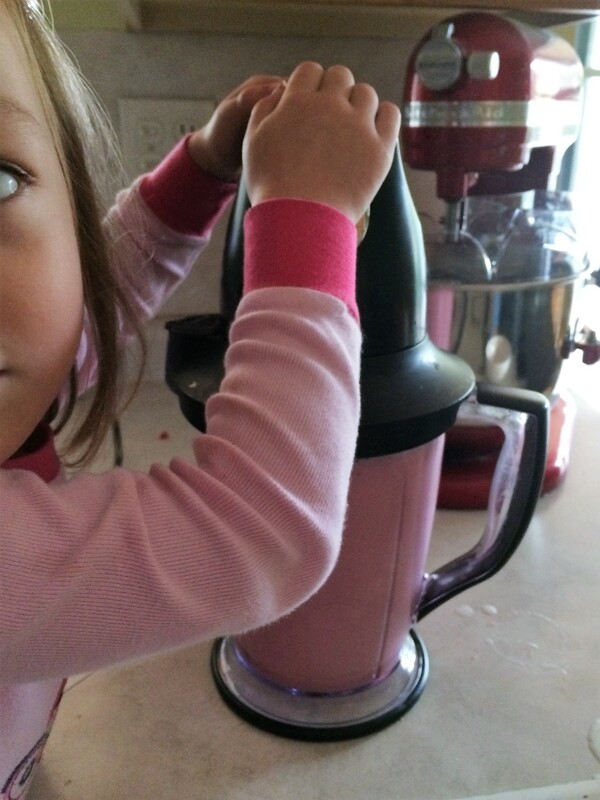 My littlest love to help and smoothies are a good way for her to feel helpful.